This feast honors the mother of Jesus as mother also of the Americas. 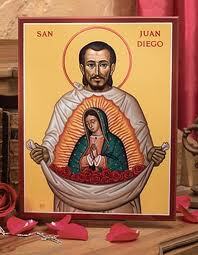 Mary appeared to Juan Diego, an Indian convert to Christianity in Mexico, on December 9, 1531. It was in the early hours of the morning. He was on his way to Mass. He had come to a small hill called Tepeyac, when he was startled by a sudden effusion of birdsong from the top of the hill. When he went to investigate, he saw a beautiful woman clothed with the sun. She spoke to him respectfully, and identified herself as Mary, "Mother of the God of Great Truth." She conveyed a message of love and mercy, and asked that a hermitage be built in that place, where all people could speak to her. 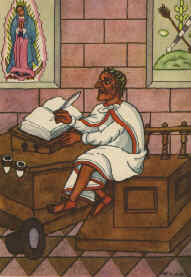 Juan Diego went to Mexico City and presented himself to the Bishop as Mary had asked him to do. The Bishop was skeptical, but believed in the vision after Juan Diego returned to him a third time, his tilma filled with roses from Tepeyac. When the roses fell to the ground, they revealed the image of Mary on the tilma, now enshrined in Mexico City. In this image, Mary resembles a mestizo, a woman of both Native American and European ancestry. She wears the blue band of expectant Aztec women, and on her womb appears a flower, the Aztec symbol for new life and a new era. She blocks the sun, which the natives had worshipped as a god. The image of Our Lady of Guadalupe is widely revered as a symbol of God's love for all American natives.